Rick Shackle's Delta State University Statesmen faced the defending national champion Troy State in May 1988 and Delta State came out on top. Shackle was right in the middle of it. His team up by two in the ninth, he shut down the champs, getting the final two outs with the tying run on first, according to a wire account. Shackle would go on to turn pro the next year and play five seasons in the minors. He made AA, but no higher. 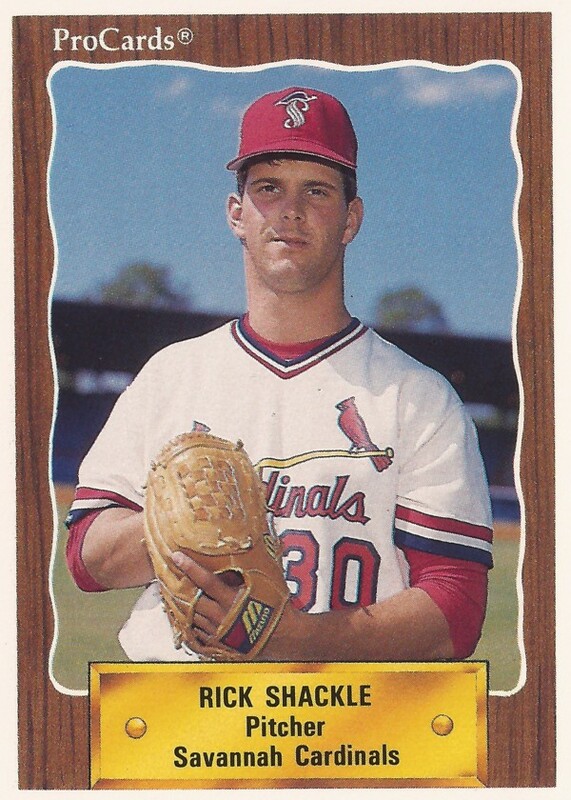 Shackle's pro career began in 1989, signed by the Cardinals as an undrafted free agent out of Delta State. 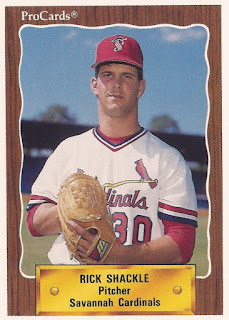 At Delta in 1989, Shackle had a 6-5 record and a 3.38 ERA by mid-May. He also made the all-conference team and won Delta's Most Outstanding Pitcher award. With the Cardinals, Shackle started at rookie Johnson City. He got into 15 games, 10 starts, posting a 1.67 ERA. He moved to single-A Savannah and high-A St. Petersburg in 1990. He went 11-6 overall in 25 outings, 19 starts. Shackle returned to St. Petersburg full time for 1991. He pitched his team to a 4-1 win in a June start. He went 6.2 innings in an August win, giving up a single earned run. Shackle made AA Arkansas for 1992 and he returned there for 1993. His 1992 campaign was limited to 18 outings 11 starts. He had a 2.50 ERA. He got into fewer games in 1993, 10 outings, six starts. He had a 4.57 ERA. That 1993 campaign was his final as a pro.